- Side Wings Contain Extra High Density Foam. 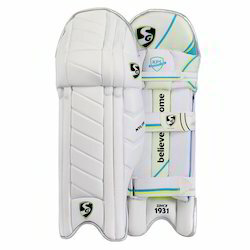 GSI Cricket Leg Guard or Batting Pad, Size: Men and Boy. Material: Made up of PVC. Size: OSM, Men, Youth, Boy. With precise expertise and understanding of the present market understanding and requisites, we are readily occupied in offering to our clients a well-designed Red Rock Cricket Batting Pads. - The moulded high density foam pads. Brush nylon laminated cross linked Polyethelyne high density foam and Anti bounce construction. New comfort inner padding. - Readily available in all sizes but can be made exactly as per customer's requirement. We offer a wide range of Flash Batting Leg Guard Ultralite. that are made from high grade material and sophisticated technology. These are also stringently tested on various parameters to ensure that the guards are perfect and in accordance with international standards. We offer them at a cost effective price. Specially made for Kids 8+ , Very Light weight, Eva moulded, 18" length. As per the specific needs of the clients, we are engaged in providing a high quality range of Cricket Leg Pad. We are successfully meeting the varied requirements of our clients by providing the best quality range of Batting Pad. Our organization provides a wide range of Batting Leg Guard Pro Light to our clients at industry leading prices. These are available in various specifications and extensively used in both one day and test series .We also provides customized solution to our clients as per their requirement. They are used in order to prevent the player from getting injured. 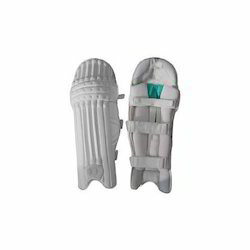 Matching up with the requirements of our clients, we are involved in offering Cricket Leg Pad.